One of the most magical sights to see in North America is the immaculate display of Aurora Borealis found at the Northern Latitudes around the Hudson Bay. Along the pristine shores of the Hudson Bay near Churchill, Manitoba, Canada you can experience the Northern Lights' radiant display of green, red and blue hues that dance across the midnight sky as the stars twinkle brightly from behind. Though Aurora Borealis can be seen from many North American destinations, there is perhaps no better place than Churchill to experience the full scale of the Northern Lights' sheer wonderment. Unlike many locations, Churchill receives spectacular Northern Lights shows throughout much of the year. In early September through mid September, and also throughout the late winter months—you can often observe a plethora of amazing Aurora Borealis light shows. Though the winter months are often peak times, September is often a more favorable month to observe the epic Northern Lights because you can also experience the Hudson Bay before it reaches sub-arctic temperatures. Aurora Borealis, sometimes called the northern and southern (polar) lights, are the mystical natural light displays in the sky that have enchanted cultures throughout history. Aurora is usually observed at night, particularly in the Polar Regions. In northern latitudes, the effect is known as Aurora Borealis, named after the Roman goddess of dawn - Aurora - and the Greek name for north wind - Borealis. Aurora Borealis is also called the Northern Polar Lights, as it is only visible in the sky from the Northern Hemisphere; the chance of visibility increasing with proximity to the North Magnetic Pole, which is currently in the arctic islands of northern Canada. Aurorae seen near the magnetic pole may be high overhead, but from further away the lights illuminate the northern horizon as a greenish glow or sometimes a faint red. 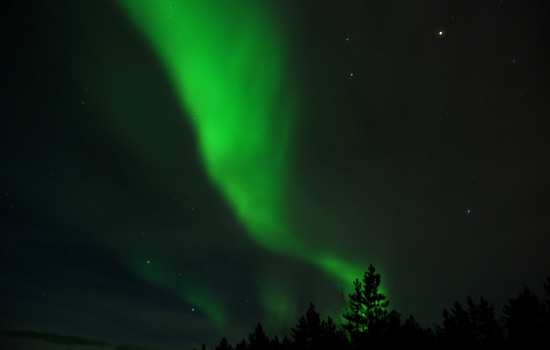 Over the years, many cultures have noted different theories and tales about the Northern Lights. Many believe that the Northern Lights spiritual and magical. In the same land that hosts the brilliant summer sightings of beluga whales and the polar bears of autumn, comes the amazing phenomenon of Aurora Borealis illuminating the dark winter skies. Watch in wonder as streaks of color dance like flames across the midnight arctic clouds. If you've often wondered about taking the sightseeing vacation of your wildest dreams, let us help you plan a vacation to Churchill, Manitoba, Canada. On this grand sub arctic adventure, the days are filled with distinctly northern culture, wildlife experiences, epic polar bear adventures, and dog-sled rides. And of course in the evenings - nature's kaleidoscope flashes before your eyes. See the Northern Lights in the most aurora-active place on earth, journey from the southern prairie to the far-north tundra on the Hudson Bay Railway, and discover the culture and traditions of northern native peoples on your array of winter adventures. Need more information on Northern Lights Viewing In Churchill? Talk to one of our Canadian travel Insiders who'd be happy to answer all your questions.